Italy with its capital Rome is located in Europe (Southern Europe, a peninsula extending into the central Mediterranean Sea). It covers some 301,341 square kilometers (almost twice the size of Georgia) with 62,137,800 citizens. Italian, German, French, Sardinian, Catalan, Corsican and Slovenian are the languages commonly used by the people in Italy (consider regional differences). Austria, France, San Marino, Slovenia, Switzerland and Vatican are bordering countries. 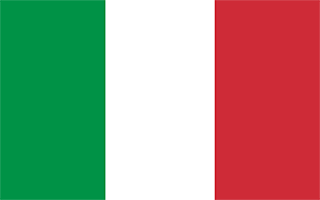 Italy is a large country in Southern Europe. Start with a visit to Piazza Michelangelo in Florence to admire the famous view. Then set about exploring the many museums, both inside and outside Florence, that house Renaissance masterpieces. You could visit Italy's cities, never go in a church, museum or Roman ruin, and still have a great time. Just wander around, keeping your eyes open. The landscape is mostly rugged and mountainous and some plains, coastal lowlands. The average density of population is about 206 per km². The climate in Italy can be described as predominantly Mediterraneanalpine in far north, hot, dry in south. Potential threats by nature are land subsidence in Venice, regional risks include landslides, mudflows, avalanches, earthquakes, volcanic eruptions, flooding and significant volcanic activity; Etna (3,330 m), which is in eruption as of 2010, is Europe's most active volcano; flank eruptions pose a threat to nearby Sicilian villages; Etna, along with the famous Vesuvius, which remains a threat to the millions of nea. To reach someone Italy dial +39 prior to a number. The local cellular networks are operated on 900 MHz, 1800 MHz, 3G, 4G. Websites typically end with the top level domain ".it". If you want to bring electric appliances (e.g. battery chaarger), keep in min the local 230 V - 50 Hz (plugs: C, F, L). The sign for the locally used currency Euro is EUR. Three equal vertical bands of green (hoist side), white, and red; design inspired by the French flag brought to Italy by Napoleon in 1797; colors are those of Milan (red and white) combined with the green uniform color of the Milanese civic guard.